A motorcyclist has been shot dead while riding along the M40 in Warwickshire. The man died between junctions 13 and 12 on the southbound carriageway near Leamington Spa on Sunday afternoon. The murder victim, aged in his 30s, is thought to have attended a motorcycle rally nearby and biker gangs are a "strong line of inquiry" police said. Detectives want to trace the occupants of a green Rover car seen close by when the man was shot. The M40 is expected to remain closed into the late morning. "Road rage is not a line of inquiry. We are treating this as murder," said a police spokesperson. It is thought the victim had attended the Bulldog Bash, billed as Europe's top biker party, held at Long Marston airfield near Stratford. Det Supt Ken Lawrence, of Warwickshire Police, told the BBC that 20 to 30 police officers were at the scene and potential witnesses were still being interviewed. He said they wanted to speak to people travelling in a Rover 620 saloon who may have been linked to shooting, which took place at about 1420 BST. "One or two witness accounts have mentioned this car being close to the motorcycles at the time that something clearly happened. "It is for that reason that I want to trace that car and speak to the occupants and see if they saw anything or know anything." He said there was large crime scene spreading along the motorway's carriageway and it would take officers a good time to carry out the searches. 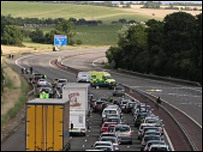 The incident caused 10-mile tailbacks in both directions with about 400 cars caught within the crime scene. They were all allowed off the motorway by Sunday night. The M40 remains closed between junctions 10 and 14 northbound and between junctions 14 and 12 southbound. Det Supt Lawrence said the southbound carriageway would probably remain closed until late on Monday morning and possibly until lunch time. Paul Roberts, from Worthing, was driving along the M40 when the incident happened. He said: "Suddenly we had to stop... soon other motorists were out of their cars and on the carriageway. "One lady in a BMW took a first aid kit to the man who was lying on his front just next to the central reservation. "It was very noticeable that the man was very still and was not wearing any shoes." Police are appealing for any motorists travelling on the M40 who may have witnessed the incident to contact them. An incident room has been set up at Warwickshire Police headquarters.